Alongside our extensive air conditioning services, Bunten A/C Service offers other HVAC services as well. You can trust our experienced owner and his team to perform a range of HVAC services to maintain the comfort of your home or business. Heating: While you may not rely on your heating unit as often as your air conditioning unit, it’s nice to know that it will be there to work when you need it to perform. Bunten provides heating services for Austin, TX residents – from general repairs and maintenance to full replacements/upgrades. Maintenance plans: Make sure your HVAC systems are good to go by calling Bunten for maintenance services. Every spring and fall, our team can come by and check-up on your units to ensure functionality during the winter and summer months. Air quality and purification: When it comes to comfort, air quality plays a big role. If you’re sneezing or coughing every time you enter your home or business, it’s time to call an air quality professional. Our team will come test the air quality at your Austin home, and recommend/provide air purification services for your home if needed. Duct replacement: Ducts are basically the lungs of any building. If they haven’t been cleaned or treated in a while, it might be time for a complete replacement. Call our team to learn more about our Austin duct services. 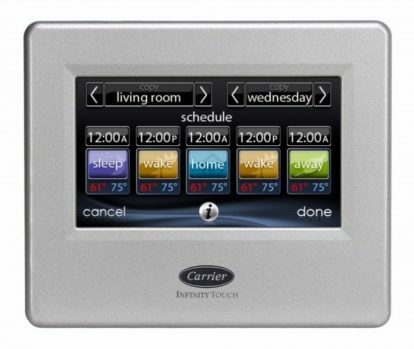 Programmable thermostats: Upgrade the thermostats at your home or business in no time with Bunten. We’ll come in and wire a completely new thermostat unit that provides great benefits for any user. To get started with any of these services, get in touch with Bunten A/C Service today!